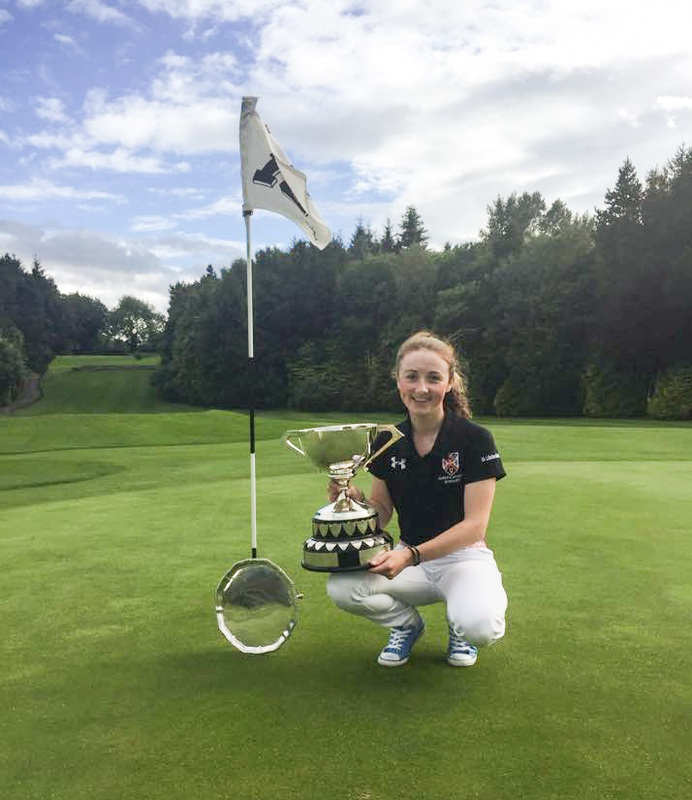 Jessica Ross (Donaghadee) has set her sights on an Irish call-up after winning the Ulster Championship at Lisburn GC. The 20-year-old, a chemical engineering student at Queen’s University, beat Shannen Brown (The Heath) 2&1 to secure the title. Victory came as something of a relief for Ross who entered the tournament as favourite following a brilliant six-under par 68 in the final round of the Ladies British Amateur Strokeplay Tournament that saw her finish joint third. “I felt a bit of pressure but I knew that I was hitting the ball well enough going into the event,” said the plus-two handicapper. In the final Jessica lost the fourth to a birdie, but hit back with wins at the sixth and eighth to go in front for the first time. Shannen levelled matters before Jessica made a significant move, winning the 15th and 16th, closing out the match with a par on 17. “I have been playing pretty consistently all season without doing anything spectacular. I think everything sort of came together towards the end there at the British and at Lisburn,” added Jessica who won the Intervarsities Series earlier in the year, as well as the overall Order of Merit. “I would love to make the Irish team for next year’s European Championship. GARY Wardlow got into his stride early and did the winning work without delay in the Daly Golf Ulster Grand Prix on the Dunluce course at Royal Portrush. He birdied the first two holes, finished two-under-par and one shot ahead of the chasing pack. The Dunmurry attaché opened with a 10 foot birdie putt, after a drive and wedge to the green, and followed that up with a drive and nine iron to the second to set up another birdie. He then covered the remaining 16 holes in regulation with three birdies and three bogeys pencilled in. Remarkably, Wardlow made nine straight fours on the back nine – two birdies, five pars and two bogeys. Donaghadee scratch player Neill Boyd and Johnny Hagan, who plays off plus-one out of Kirkistown Castle, both returned gross 36 points with the former in first place on countback. The nett winner was Joe Dowey from Lurgan. The Kirkistown Castle duo of pro Neil Graham and amateur Johnny Hagan won the team betterball award with 44 points. Professionals: 70 (-2) – G Wardlow (Dunmurry). 71 – G Chambers (Killymoon), N Graham (Kirkistown Castle). 70 – N Murray (Massereene), P Farrell (www.philfarrellgolf.com), B McElhinney (Foyle Academy). Amateurs: Gross, 36 pts – Neil Boyd scr (Donaghadee), Johnny Hagan +1 (Kirkistown Castle) . Boyd takes first place on countback. 35 – Gary Clarke scr (Lurgan). Nett, 36 pts – Joe Dowey 5 (Lurgan). Team: 44 pts – Pro Neil Graham & Johnny Hagan 5 (both Kirkistown Castle).